I've done a lot of driving through Istria but have not seen Istria from the sky. It was always on my bucket list and should be on yours too. If you decide to take panorama flights, your best choice is Aeropark Vrsar. As expected, the views were amazing. Aeropark Vrsar offers so much more than panorama flights. For starters, there are a lot of airplanes to see. And, best part, all cockpits are open so you can get into all of the airplanes. How cool is that! 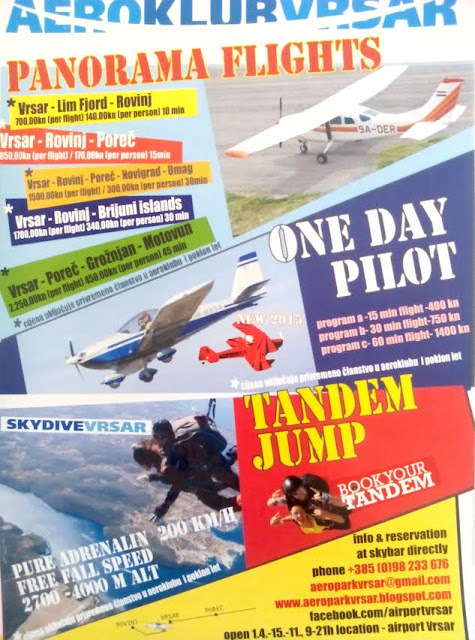 Locals, and anyone who often flies to the Vrsar airport, can also join the Aeroklub Vrsar club to connect with other pilots and flying enthusiasts. Vrsar Aeropark is located at the Vrsar Airport at Crljenka 6, Vrsar 52450, in Istria, Croatia. You can contact Aeropark Vrsar via e-mail or by phone at +385(0)(98233676. Happy flying and good luck skydiving!